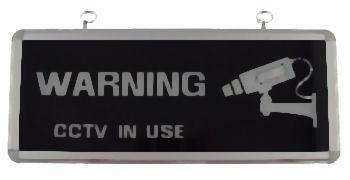 The Lighted CCTV warning sign can be used in conjunction with a real or dummy camera and helps to deter crime, shoplifting, etc. The sign can be suspended by using the two attached rings or mounted to a wall by the screw holes on the back (screws not included). Requires a DC 9 volt 0.65A wall adapter (included). The sign is lit by 24 led bulbs (12 on the top and 12 on the bottom). Measures: 14-1/4" x 5-3/4" x 1"